It's Your Story! Yes, Yours! Saunders Medical Center sought to create a unique and superb facility serving their community. The new facility was built in 2007. Who did this? You...your neighbors....who serve the county. They created a facility to serve their own families and loved ones. Your community worked to design a clinic to serve your everyday health needs, a hospital to serve your urgent care, surgery center to repair, a therapy facility to rehabilitate you and and a long term care facility that is like no other. Saunders Medical Center has the latest equipment and caring staff possible. We are not your typical rural hospital doing things small. We do it right and we do it big! We have professionals in every area of our facility—they are passionate about delivering cutting edge technologies, the best service possible, and most importantly loving and healing care. They are your neighbors, friends, family....and care for you as if you were family. Thank you for your interest in Saunders Medical Center and for looking to us for your healthcare needs. Regardless of one's needs, Saunders Medical Center offers the latest technological healthcare advancements, as well as the personal attention that we would want for our own families. Services and programs of Saunders Medical Center are provided to all persons without regard to race, color, national origin, age, disability or diagnosis. 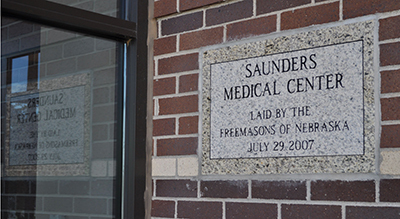 Saunders Medical Center has been serving Saunders County for over 90 years, as a county-owned health care facility. The SMC facility consists of a critical access hospital, a rural health clinic and a long-term care facility, offering 19 medical specialties. SMC is owned and operated by Saunders County, a political subdivision of the State of Nebraska. See our non-discrimination policy here. Care is delivered by board-certified physicians, as well as a highly-skilled staff of medical professionals and support staff. Emergency care is provided 24 hours/7 days a week. All services are conveniently located on our campus. Saunders Medical Center is a member of the Heartland Health Alliance, 48-hospital member organization created in 1995 to help members enhance the delivery of rural health care. The goal of the Alliance is to ensure each hospital's local control and autonomy, while providing resources to address managed care issues and other changes in the health care environment.